Hundreds of female gilets jaunes marched to champion the power of peaceful protest this weekend, amid news of continuing police violence, and a professional boxer accused of assaulting a police officer. 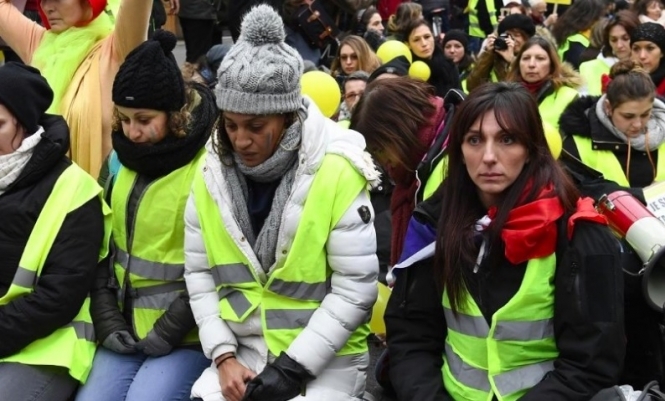 Across France on Sunday December 6, hundreds of women joined together, wearing the symbolic gilets jaunes yellow vests, but also holding yellow balloons as a symbol of non-violent protest. In Paris, 300 to 500 women marched through the streets, singing French national anthem La Marseillaise as they sat on the steps of l’Opéra Bastille, surrounding the square and stopping traffic until mid-afternoon. Similar movements were seen in Marseille, Toulouse, and Caen. The women’s march comes as violence - both of the police, and of protesters themselves - continues to dominate the gilets jaunes coverage. In Toulon (Var) this weekend, a woman named Séverine Charpentier lodged an official complaint after being allegedly struck on the head in anger by a police officer during a protest. She suffered cuts, bruising and whiplash, and will need to be in a neck brace for ten days as a result, according to her medical certificate from January 5. Ms Charpentier said that she recognised the officer who hit her as a man known as “Didier A.”, who had already been filmed hitting two other people at the same protest. The man denies her allegation. The woman and her friends, also at the scene, said they were not taking part in the protest and only became involved after questioning a police officer who was allegedly acting violently towards a male gilet jaune. The Var prosecutor has confirmed that an inquiry has been opened into police violence in Toulon. But violence this weekend was not limited to police officers. Police in Paris are now actively looking for a man who was captured on video (below) repeatedly provoking and punching a police officer. The man, who has been identified by police as Christophe Dettinger, is believed to be a former professional boxer. Patrice Ribeiro, general secretary of the Synergies-Officiers union, said: “This individual, without a gilet jaune vest, is one of these people who come here solely to attack law enforcement officers. This kind of behaviour must be severely punished, meaning closed prison." Mr Dettinger is reportedly on the run after the incident, and has not yet been found. His victim has been prescribed 15 days off work as a result of his injuries. Mr Dettinger had won 18 boxing victories, and was French champion in the lightweight category in 2007 and 2008. His former trainer, Jacky Trompesauce, said he advises Mr Dettinger to go to police. The statement continued: “This is extreme violence, totally against the values taught by discipline."